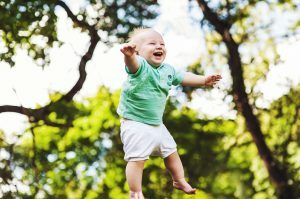 We all know that you can’t stop children having bumps and scrapes, but you can be their summer superhero by knowing how to come to their rescue. These seven tips can give you the super powers you need when they think it’s the end of the world. Don’t just save them, but protect them from danger in the first place. When the kids are playing out in the sun, keep their (and your own) skin free from burns and sun damage by applying sun cream- SPF 50 will provide the best protection. Make sure to reapply regularly, especially if playing in water/swimming. Try to keep them out of the sun between 11am and 3pm when the sun is at its strongest and make sure they wear a sun hat. Avoid heat exhaustion or heatstroke by making sure the family stay hydrated on hot days. Give them water or diluted squash or fruit juice to make sure they have plenty of fluids. If children do become dehydrated, you can get rehydration fluids from the pharmacy. Sometimes the villain in a child’s life is a door or any other stationary object when they run into it head first. Most bumps are minor and can be treated with hugs, a cold compress and some children’s pain relief. If, however, your child has any dizziness, unconsciousness, repeated vomiting or a headache that is getting worse, NHS 111 can offer 24/7 advice on the best course of action to take. Just dial 111. Minor cuts and scrapes can be treated easily with your first aid kit. Wash any cuts with clean water, stop the bleeding and apply a plaster or dressing. Any cuts where the bleeding is uncontrollable, or it is spurting with the pulse seek immediate medical attention. Like cuts, minor burns can be treated at home. Run cool or lukewarm water over the affected area (never ice water) and remove clothing close to the burn. If anything is stuck to the burn, avoid pulling it off. Wrap the wound in plastic food wrap as it can be used to protect the area. Any burns that are particularly large, deep or that have caused charred or white skin require immediate medical attention. Charging around playing make believe can take its toll on the muscles and lead to strains and sprains. Most of these can be treated with ice, compression and elevation. If you are concerned a sprain could be more serious, your local minor injuries unit can check them over. Remember, you don’t need a cape to be a superhero.